Synopsis: When the beloved cellist of a world-renowned string quartet receives a life-changing diagnosis, the group’s future suddenly hangs in the balance: suppressed emotions, competing egos, and uncontrollable passions threaten to derail years of friendship and collaboration. As they are about to play their 25th anniversary concert, quite possibly their last, only their intimate bond and the power of music can preserve their legacy. Inspired by and structured around Beethoven’s Opus 131 String Quartet in C-sharp minor, A LATE QUARTET pays homage to chamber music and the cultural world of New York. Yaron Zilberman’s A Late Quartet jettisons character plausibility in favor of pop psychology and leaden instrument analogies. It’s all talk and some play: calculated to be tasteful, but also intertwinded Larry David-esque (Creator of the Seinfeld Dramedy) and—aligned with a quoted line from T.S. Eliot, “the end precedes the beginning”. 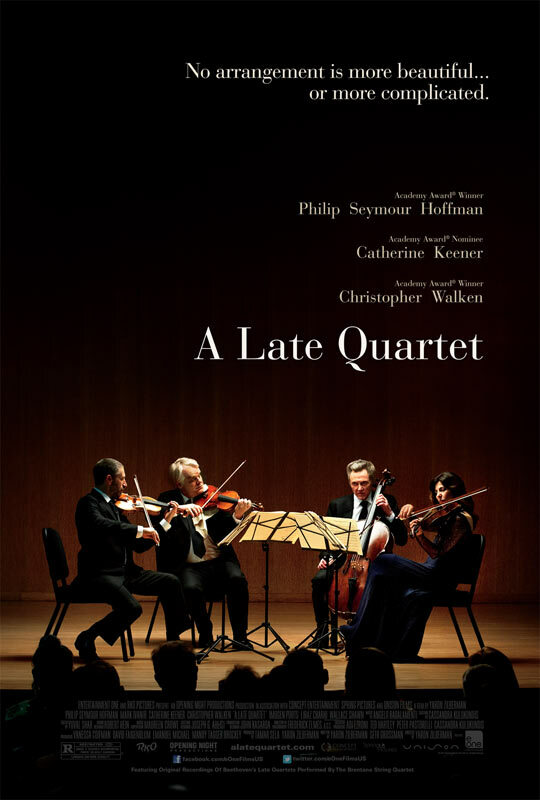 After 25 years and over 3,000 performances, the Fugue String Quartet is greeted with some potentially devastating news when their most senior member, cellist Peter (Christopher Walken), announces that he’s experiencing the early stages of Parkinson’s disease. The diagnosis serves as the catalyst for personal, artistic, and professional entropy as first chair violinist, Daniel (Mark Ivanir), and married second chair violinist and viola player, Robert (Philip Seymour Hoffman) and Juliette (Catherine Keener), respectively, struggle to imagine a collaborative future without Peter, the quartet’s big-hearted stalwart. Caught in the middle of this time of uncertainty—and the growing dissonance in communication between the quartet—is Robert and Juliette’s flinty and flirty daughter, Alexandra (Imogen Poots), a music undergrad who serves double time as part-time audience surrogate and part-time naïve narrative agitator. Inappropriate liaisons, ego-bruising conversations, and familial conflicts ensue, with the characters growing less convincing with each piled-on contrivance; the film too quickly gives way to neat connect-the-dots monologues about interpersonal dynamics and rudimentary music theory. As the film’s characters are part of Manhattan’s culturati, it’s difficult not to imagine them, were this real life, groaning at all the on-the-nose metaphors so freely spewed throughout. A documentarian working on his first narrative feature, Zilberman uses a snow-dappled New York City winter as the setting, developing an icy veneer meant to reflect the ensemble’s often chilly and alienated demeanors. This careful observation is a logical step in Zilberman’s filmmaking process, but he doesn’t allow the milieu and narrative to organically commingle—despite the ubiquitous theme of collaboration. He’s more attuned to providing context for his pawns than actually imbuing his own heavily outlined creations with depth. After roughly the fourth flowery elaboration on the creative distinction between playing solo versus being part of a group, it’s baffling that Zilberman doesn’t take his own advice, loosen his control a bit, and find inspiration in the interesting dynamics between the characters; consequently, A Late Quartet is left feeling tightly wound and forced. Beethoven’s Opus 131 is presented as the film’s thematic framework, but it’s not a very apt fit. Peter explains an interpretation of the illustrious opus, which is meant to be played furiously, to his students: “Playing for so long without pause, our instruments must, in time, go out of tune each in its own quite different way. It’s a mess. What are we supposed to do? Stop? Or struggle—and adjust to each other up until the end, even if we are out of tune.” This kind of obvious allusion is spread throughout the film. The irony of this particular passage, however, is that Zilberman never allows his actors the opportunity to be free, or constantly recalibrate; the ever-reliable cast of thespian vets taps into the lifestyles of these seasoned musicians, but the characters are so rigid that there’s not much to elaborate upon. The whole production is stuck on one level in which every moment seems predicated to appeal purely to a middlebrow sensibility. The script and direction, however, remain out of tune, leading to an ambivalence in tone that registers as flat. Zilberman is unsure whether to surrender to theBehind the Music melodrama he’s orchestrating or simply coax specious emotions by layering light violin music over dramatic scenes.